if someone knows how i link a single photo in here tell me lol. 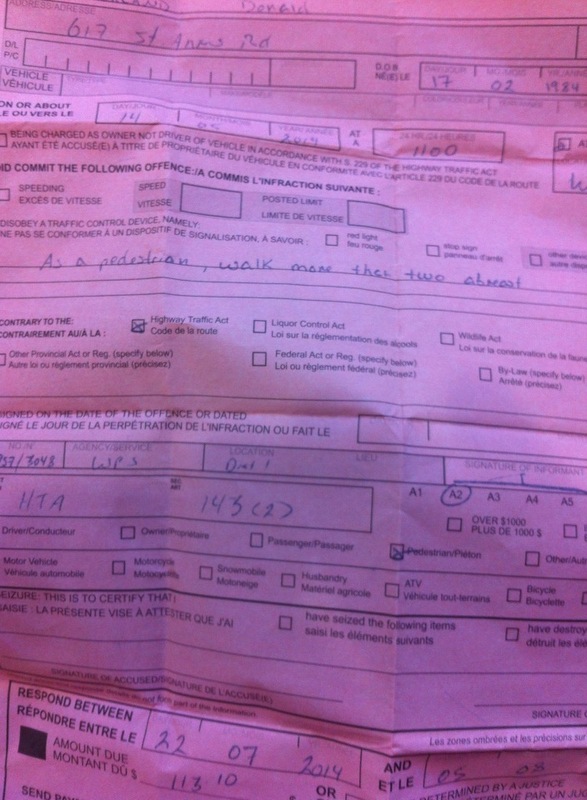 a friend got a ticket for walking down the sidewalk with 2 people beside him. it says the fine is 113 dollars for walking with more then 2 people side by side. what the hell? you're trying to post an imgur and photobucket link, not the actual image. as far as i know, photobucket isn't too keen on allowing direct linking, but imgur is. you need the “.jpg” extension in your link. in your imgur case, you get it by clicking on the image again, so it opens nothing but the actual JPG. then copy that address and paste it between the img tags here. Serves ‘em right, walking more than two abreast. Apparently, in some countries that’s just as bad as cursing at a cop or speeding through a school zone. I am in canada… and nobody will be paying that fine. its some crap none of us have ever heard of. and cursing at a cop is not a crime unless he is busy with someone else and you are disrupting him. atleast here in canada. speeding through a school zone is the only big no no because its unsafe for children.